Below find freebies and giveaways including free 3D models, full 3D scenes, texture packs, HDRI’s and VRay material libraries. Here we will include VRay material sets, including car paint material packs, architectural material packs and many more. Keep an eye out for our free HDRI downloads including HDRI sky download packs. Also included will be 3D model packs such as furniture sets, car 3D models and more. We will update this page regularly so check back often. To download simply show your support by sharing or liking us and the download links will appear for all freebies below. 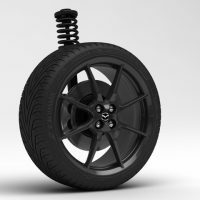 The New Mazda MX-5 Alloy Wheel 3D Model. Unwrapped UV's, & textures included. 5 high quality pearlescent Vray car paint materials, based on TVR factory colours. Included in this pack are 6 stunning show car paint materials. Here is a pack of 10 high quality & tileable water droplet textures available to download for Free! This is a free pack of 8 high resolution leather textures, including a bump texture. Download these leather textures free. All textures are for commercial use.